On International Women's Day, we celebrate the significant contributions women are making around the world, especially in agriculture toward helping secure our global food supply. On average, women represent 43 percent of the agricultural labor force in developing countries and up to 30 percent of all farmers in the United States. At Kellogg, women farmers play an important role at the start of our food journey. They are responsible for growing and nurturing the grains and other ingredients we use to make many of the delicious cereals and snacks consumers enjoy today. From seed planting to harvest, these farmers take great pride and care in their work, although in some regions often lack access to the resources they need to achieve their full potential. We also recognize that in many countries, women often lack the opportunities needed to enable them to reach their highest potential. As part of our Global Sustainability Commitments, Kellogg is identifying women farmers and workers in our value chain and developing programs to help improve their livelihoods, their families and communities. This pledge also supports the United Nation's Sustainable Development Goal (UN SDG 5) of achieving gender equality and empowering all women and girls, which we celebrate on International Women's Day. Today, we are proud to announce that Kellogg has supported 10,000 women farmers around the globe. This achievement is reflected in the work of our responsible sourcing team and in part, our Kellogg's Origins™ Program, which is designed to provide education, training and other resources that focus on climate-smart agriculture. Over the past few years, we have seen the program positively impact women farmers such as Marisol, Cecilia, Rita, and Jayna, who grow grains to make our Special K® cereals and snacks. In Europe, we partnered with Marisol, a rice farmer in Spain's Delta Del Ebro region, to leverage natural agronomic practices to help recover and protect the soil where she grows the rice for Special K® cereal. Through this program, participants have seen annual yields increase by approximately eight percent, which also drove an increase in income and efficiency. In Latin America, we provided on-site soil health and financial training, as well as recommended best practices in sustainable agriculture to women farmers such as Cecilia in Bolivia, who grow the quinoa used to make delicious Special K® Nourish foods. Through that program, we have impacted more than 600 families in the region. In North America, Rita, a Michigan farmer who grows the wheat for a variety of Special K® cereals and snacks, is participating in the Kellogg's OriginsTM Great Lakes Wheat Project where we are helping her identify opportunities to implement new conservation practices. In 2015, Kellogg nominated Rita as a White House Champion of Change, which she won for her work educating the community about how food is grown and the importance of farming conservation practices. In Asia, we helped introduce a new rice variety for Special K® cereals in Thailand. This work impacted 700 farmers, 60 percent of whom are women. Through the program, smallholder farmers such as Jayna now have access to a long-term market for selling a high-yielding, pest resistant rice variety. 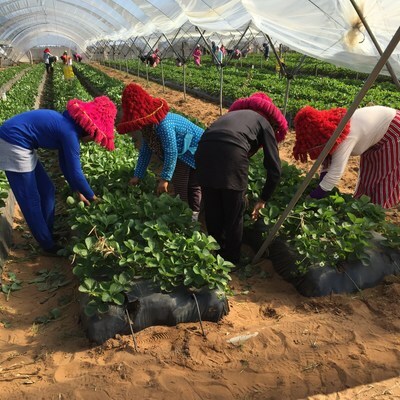 And in Africa, we are building our understanding of opportunities to drive continuous improvement with women farmers and workers on strawberry farms in Morocco who are growing some of the fruit that goes into Special K® Red Berries cereal. We believe these efforts will contribute to a more sustainable food supply in the future and at the same time, help empower more women so that they can live life at full strength. Looking ahead, we will continue to participate in events and on-the-ground programs where we can make a positive impact. At Kellogg, we are proud to have helped feed the potential of 10,000 women farmers, and recognize that in partnership with others we all still have a lot of work ahead. But at the heart of all of these efforts is our purpose to nourish families so they can flourish and thrive, by helping to fight hunger and feed potential – from the farmers who grow our ingredients, to the families who enjoy our foods around the world.